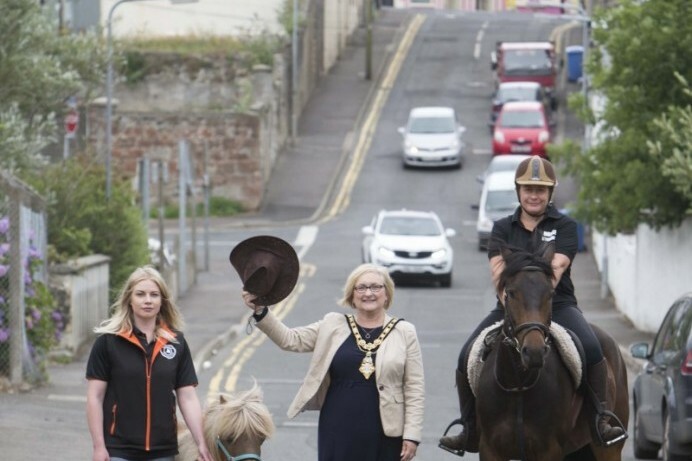 Visitors are reminded to allow extra time for their journeys as the Ould Lammas Fair returns to Ballycastle from this weekend. On Bank Holiday Monday (August 27th) and Tuesday (August 28th), a park and ride facility will operate from McQuillan's GAA ground on Whitepark Road. All buses are fully wheelchair accessible and the service will run every 20 minutes to North Street from 10am – 7pm at a cost of £5 per car. Please follow directional signage to avail of this convenient service. Visitors can also pay to use private park-and-walk sites at Kilns Road, Leyland Road and Moyle Road. There will be limited places available in the free public car park at the Harbour. Disabled parking facilities are located at Market Street and at the seafront. All motorists travelling to Ballycastle are asked to follow directional signage which will be in place to help alleviate any potential traffic congestion. Traffic travelling via Coleraine will be directed to Ballycastle through Bushmills, using either the Straid Road or the Coast Road. Diversions will be signposted around the town including Whitepark Road, Clare Road, North Street, Cushendall Road and Mary Street. For those travelling on public transport, there will be an enhanced Translink Ulsterbus Service to Ballycastle – for more details go to www.translink.co.uk or phone the Translink Contact Centre in 028 9066 6630. For the latest updates follow Causeway Coast and Glens Events on Facebook and Twitter. Visitors can download the Translink bus timetable for the Ould Lammas Fair by clicking on the link below.